Move forward two decades, as Scott Wilson traversed New England and New York to get a look at nearly every barn. After looking at thousands of barns he knew what he wanted: an authentic 18th century barn with an open, airy interior and all the charm and warmth that only comes from a real barn. Goal: to erect a timeless structure that would stand proud, and yet, fit snuggly in the cocoon of the surrounding landscape. 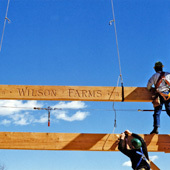 Logging oh, about 2,000 miles, and consulting with their friend Tommy Silva from "Silva Brothers Construction", they met and hired expert timber framers, Benson Woodworking of Alstead, New Hampshire. After interviewing 15 architectural firms, they settled on architects Bechtel, Frank and Ericson of Lexington. Soon, something was shaping up: a barn to be exact. A barn the whole family - and every customer would love. Unveiled in 1996 (amazingly closing a mere 2 hours early to make the move) and heralded by a ribbon cutting by town Selectman, the entire Wilson family, and friends. The 8,500 square foot barn was built of recycled lumber with only four joints containing metal, everything is pegged together. The former homes of the timbers included: a US army arsenal in Minnesota, the Royal Typewriter factory in Hartford, and from places as far away as Idaho, Washington, and Salt Lake City. 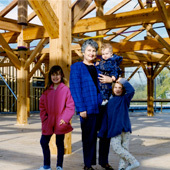 In 2000, the barn was joined by a state-of-the-art 37,000 square foot greenhouse; now a favorite touring site for local and national growing associations.